If you are a fan of videos, films, series or watching television in general than you know how expensive subscriptions are and how frustrating it can be when you travel and then found out that the country has placed some kind of restrictions on the content and you cannot view nor do anything about it. This is the predicaments of most people because even with VPN connections, you still can’t bypass these restrictions and this was what prompted the founders of Monvid to create the platform. The monvid platform is a decentralized community network which uses the blockchain technology to cut-pass restrictions, filters, and censorship to deliver a video streaming service platform that is easy to use and advert free. The founders wanted to give people the experience of watching their favorite videos without any restrictions irrespective of where they are. Their vision was to use the blockchain technology. Monvid has a Mission to launch the monvid’s platform with- a decentralized and proxied video and TV streaming to bypass all restrictions and censorships around the world. “Due to the blockchain technology and the fact that it is decentralized enable Monvid to provide its users with services that are better than what they are already getting.“ says Antonio Jacobs CEO of monvid. We at monvid understand all the problems and issues one can have in a lot of countries for watching their TV-Programs, Movies and Videos just because the county has a lot of censorships or the TV-providers do not support the country for showing the contents in. This is why this project has started. The platform is going to be developed to function in two different ways. Peer-to-Peer Video Sharing This functionality will allow content owners and video creator to share their videos for everyone to see for free without any fees and this video can then be rewarded by the community members. Whenever a user watches a creator video and would like to support their work, they can reward the creator with some MVID. The owners usually will get these rewards at no additional or hidden cost. These rewards may depend on the quality of the creator’s videos and the streaming quality that the community members got. This type of streaming is transparent, flexible and private. Monvid platform allows users to be able to bypass any restrictions that would have hindered it from streaming videos on the normal centralized platform. Due to its decentralized nature, the user can create a bridge between the platform and themselves using their computer from wherever they are. In simpler terms, if a user is one country and the creator is another country and the user wants to stream the creators content but due to some restrictions cannot in the regular streaming app with Monvid all those restrictions can be easily bypassed and the video streamed. The user is still safe as the platform only accept stream packets. Monvid is seeking funding between a soft cap of $500.000 and a hard cap of $5.000.000. The tokens will be compliant with the stable ERC-20 standard and can be held in most common digital wallets. ERC stands for Ethereum Request for Comments. There are newer versions of ERC like ERC-223 and ERC-721 but monvid decided to not use them because of some of disadvantages and risks with those newer versions. ERC-223 is a proposal right now, not a standard. Therefore, there are none of the high-profile ICO tokens deployed with this standard. Also it is not yet implemented in any production tokens. Exchanges might need to do some modifications in order to support such token. There is options that some of the exchanges might not be prepared for it yet. With the creation of the MVID Token we are taking a step towards fulfilling our mission but also to leading the International Film Business further into using and accepting virtual currencies. Users of monvid will be able to take advantage of a discounted payment for content by using MVID Tokens. Other alternative leading virtual currencies can also be used as payment on the Platform. There are a maximum number of Tokens every can be generated during the Token-Sale which is 200M Tokens. 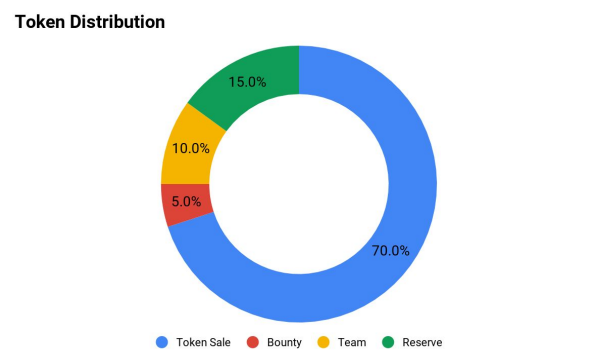 Only 70% of these 200M Tokens will be for the Sale and the rest are for the team, reserved tokens and also the bounty programs for the marketing of monvid’s Token-Sale. All unsold tokens will be burned and no new tokens will be ever generated after the token-sale. The monvid community wants to raise money for the actualization of this huge project through ICO (initial coin offering) and the pre-sale of the initial coin offering will start on the 15th of April 2018. The main-sale of the initial coin offering is not announced yet but it would be in the second quarter of 2018. The MVID which is the token to be sold through the ICO is priced at 0.00005 ETH which is equal to about $0.03 with the current rate of ethereum and during the sale bonuses of up to 100% can be yours at the beginning of the sale which will be ending on the 30th of April 2018. Q1 – 2017 The idea & first marketing research monvid Early 2017, Antonio and Adrian, two idea maker of this project started to build a team for developing this decentralized video streaming platform. Q3 – 2017 Gathering more information about CrowdFunding After building up the team, we were ready to learn more about the big technology the Blockchain and also getting help from CrowdFunding to get more investors for our project. Q1 – 2018 Token Sale Preparation ICO After researching the market and learn more about the Initial Coin Offering on Ethereum Network, we are preparing for a Token-Sale to get it used for the monvid platform. Q2 – 2018 Token Pre-Sale & Start of the Token-Sale In the second quarter of the year, we will start the token pre-sale and be preparing for the main sale. Q3 – 2018 Token Sale finishing and getting listed on Exchanges We are already in discussing with a lot of top exchanges around to get our Token to be traded on the public. These are Bittrex, Binance, Tidex, HitBTC, KuCoin, but not final decisions. However we try to get the best for our investors. Q3 – 2018 Alpha releasing of the monvid Platform Right after finishing the ICO, our team will release the first alpha version of the monvid platform and starting attracting more customers to this platform. Q1 – 2019 Releasing the final version of the monvid Platform We are going to release the final version of the monvid platform for the public use in the market .